This was an exciting production filled with a talented, young, vibrant and excellent cast! Annie JR brings this classic tale to life in a modern style mega live show. Our amazing singers, dancers and performers relived the songs we all love from the musical movie including Hard Knock Life, Maybe, Tomorrow, Easy Street, NYC, Little Girls and much more! 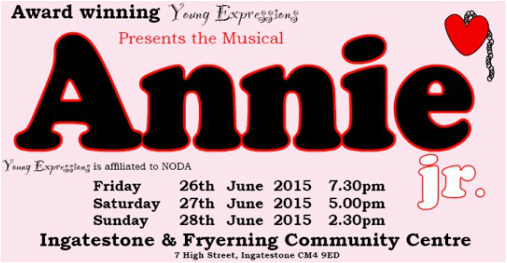 Annie is a spunky young orphan girl who lives in a miserable orphanage run by the terrible Miss Hannigan. Her seemingly hopeless situation changes dramatically when she meets very wealthy business man, Oliver Warbucks. Annie quickly charms the Warbucks mansion and they create a warm bond to which Mr Warbucks offers to help her find her parents. However evil is about, when Miss Hannigan’s brother, Rooster, and a female accomplice, plan to impersonate her long lost parents in a plot which puts Annie in great danger! Don’t miss this Musical Extravaganza!. So far, due to prior engagements, I have not been able to attend to watch the actual performances of Young Expressions Summer musical. However I am very pleased that the Director, MD and committee agreed for me to go and watch the dress rehearsal. To be honest it could have been their first performance as all the cast were excellent, working really hard, projecting better than many adults! The only thing missing was the audience and I am sure that they will enjoy the performance as much as I did. It has been a joy to watch some of the older members of the cast grow in skill and stature, and it is lovely to see a lot of new younger members coming into the group. Young Expressions have clearly got a winning formula and long may it continue. The junior version of this show has all the best things from the full version, what has been cut is not missed! I agreed with Director Emma that the song Easy Street could have been a bit longer but what we saw was well performed and thoroughly enjoyable. Melina Angeli made a delightful Annie, she spoke her dialogue with conviction and sang her songs well. Grant Clark played Oliver Warbucks, not an easy role but he did an excellent job with plenty of confidence. Megan Greenwood seemed to relish the role of Miss Hannigan, and she commanded the stage in her scenes (just as the character should). Georgia Bennett played Grace Farrell very well indeed, she had a lovely friendly manner towards Annie and the children but displayed just the right amount of character to deal with Miss Hanningan. Jared Bates played the Butler Drake with terrific characterisation. These five, in particular, have developed great performing skills since I first saw them, 3 years ago. It is such a pleasure to see this development. The rest of the cast were all excellent, there was a great sense of camaraderie on stage and everyone was working well together. The Orphans, Sienna Doyle (July) Keira Taylor (Kate) Ella Fowle (Duffy) Faith White (Pepper) Eleanor Whitwam (Tessie) and, especially, Charlotte Fowle (Mollie) had their own characters and together were a great team. As always, I do not have enough space to mention all the rest of the cast but special mentions to James Ravenscroft (Rooster) Pippa Bloom (Lily) and Jack Doyle (Sandy). Everyone else played very important parts in the whole productions and each member of the cast gave good performances. The scenery was excellent and the costumes were spot on. There is no choreographer credited in the programme so I assume it was Emma’s work. The whole company were well drilled and the choreography was simple but very effective. Young Expressions have, once again, done a terrific job with this production and I am looking forward to the pantomime later this year. Once again, thank you for letting me attend your dress rehearsal, and I am sure that the performances were well attend and enjoyed by all.